Today my brother turns 65. I find that a bit shocking as we are just 14 months apart, and where he leads I follow. I cannot believe we are nearing the end of our working careers. He tells us he is retiring in December 2019. But I am glad that we are aging together with friendship and love. I had not intended to write a blog about my brother. He is a somewhat private person, so I will not put in a photo and I will not give him a name here. But I am going to tell some of my favorite memories. First important memory. We are about 8 and 9 years old. It was a Sunday and we had just completed a visit to my grandparents in New York City. With three of us, only two could get window seats. And it was my younger sister and my turn to have the window seats. My brother was in the middle. It was a time before seat belts, so as the car moved, we moved. Sometimes if we bumped into each other, we would scream out, “He touched me! She touched me! Don’t touch me!” Car rides were not always fun! On this day, when we got into the car, the driver’s side passenger door would not close properly, but my Dad forced it closed and locked it. Or so he thought. And he took off driving back to our home in North Bergen, New Jersey, across the river. I remember it in slow motion. As he went around a big curve going onto the highway to the George Washington Bridge, that door, right where I was sitting and leaning up against, flew open. I started sliding out of the car with the force of the movement. I heard my brother yell. I felt his hand grab my hand and pull me toward the center of the car. There was no teasing, not pushing, just a warm grabbing arm pulling me up against him as my dad pulled to the slide and stopped the car. It was a scary moment. But I was fine. Dad got the door closed properly this time. And we went home. I always think of it as the time my brother saved my life. Do not think it was always like that. Being just 14 months apart, we had our moments of fighting and our moments of companionship. We often united in either protecting our much younger sister or wanting to rid the world of her. Over the years, as we faced the deaths of our parents and other close family members, my brother has been the rock. He continues to call us “Sisters” whenever he has something to say. Like, “Sisters, sisters, let’s calm down.” I think it is his own way to remind himself that we are his sisters and we must stick together. But it is my brother who would pick me up at the airport many times I came in to see my parents in their last illnesses. It was my brother who called to tell me my Dad had passed away. It was my brother and I who cleaned out their apartment together, sorting through the things to keep, throw out and give away. His strength made it doable. It was my brother who dropped everything to be with my sister when her husband became deathly ill. Getting there as soon as he could, while I made plans to fly in with my nephew from Kansas. It was my brother who taught my niece how to drive after her own father died so young. It was my brother who said to his friends, “Do not bother my sister. Only I can do that.” It did protect me a bit from his teenaged buddies. But we still could drive each other crazy. Of course, my sister and I love him in return. We know that it is our brother who keeps the peace between us when we have a bit too much time together. His laughing questions, “Are you two still speaking to each other?” “Did you kill each other yet?” After I spend a week with my sister, are always answered truthfully. Thankfully we are both still alive. We give him the run down, only one or two fights so far. But we are okay. And he is right. He is the Best Brother Ever. And he did save my life. The Turning 60 Blues! Or the Best and Brightest Blue Ever! January 23 was not a date I was looking forward to reaching. I usually love to celebrate, and I love my birthday. But this year was different. This year I was turning 60. Somehow that age bothered me. I do not feel sixty. I do not act 60. To me being 60 meant I was not just an adult, I was old…a sage…a mentor, not a doer. And I have been a doer my entire life. Was this going to change me? I was having the turning 60 blues! My angst really began to hit me in November. On the 23 of November I was getting ready to fly from India to Israel to visit my daughter. And it hit me that in two months I would be 60. What was I doing flying around the world by myself. I was almost old!! I had just spent 10 days in India with my husband. And now I was planning to spend another 8 days in Israel. Was I crazy? No I was not. But I was really two months away from this terrible date. When I got home to Kansas in early December, the dread continued. I started talking about my age at meetings. I was seeing things differently. At many meetings I was among the oldest women in the room, instead of one of the younger ones. At one meeting of an executive committee I am on, I even said something about turning 60 and having a difficult time with it. The ladies were very nice. “You don’t look a day over 45!” One said politely. Another, who knows a bit better, said, “and you act like you are 12!” (Is that good? I wasn’t quite sure.) “A little older than 12!” I responded. The president said, “Don’t worry, you are good at any age. “ And she is older than I am. So perhaps this would not be so bad. A truly long-time good friend, one of best friends, asked if I was planning a party. Not really. I had thought about. But decided “No.” In January the weather is so iffy. No one would come. I was not in the mood. But she continued to bug me. She can be quite forceful at times. When I told her I could not find a good place. She found a place. It was less than three weeks before my birthday. I went to the bakery/luncheonette and realized that it was a great place for a party. But then I remember Miss Manners said that people should not throw a party for themselves. It was egotistical and unsightly, or some such words. And as for saying ‘no gifts,’ she considered that was rude as well. Too bad! I decided to throw a party for myself, and say no gifts. But directed people who really wanted to do something to make a donation to a scholarship fund I had started in memory of my parents. I started sending out email invitations, when my email was hacked. Which created an avalanche of aggravation. All my contacts were lost for two days till I learned how to recover. By then I had lost track of whom I had invited. So I had to send out groups of invites and individuals till I got everyone covered. I sent out 50 invitations. The room only held 40. But 12 people lived out of town. So I was safe. To my delight two ‘out of towners’ were able to attend. In all 36 people said they would come. The only No’s came from people who would be out of town for the weekend. The hearts I made for my friends. I set myself some goals. 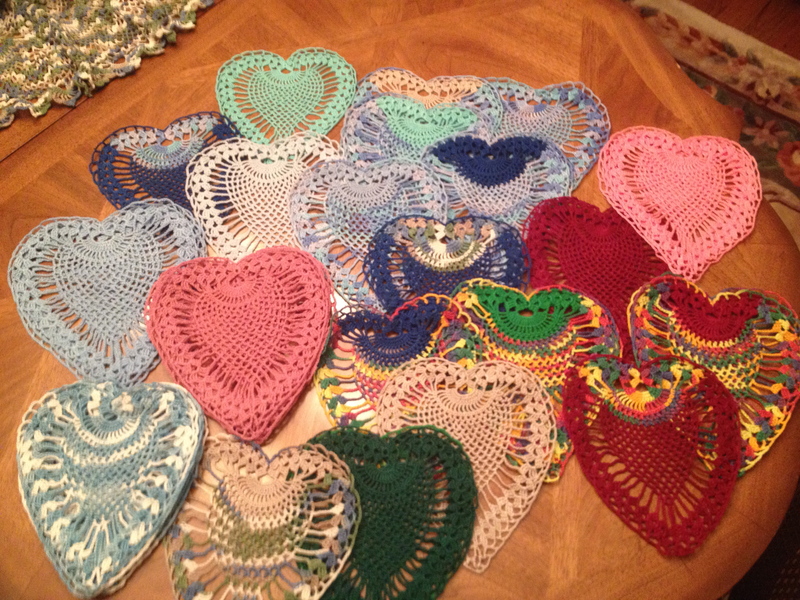 I decided to make a crochet heart for every woman who came to my birthday tea. Each one of the people I invited had a place in my heart. I decided we would all wear hats and just visit. No big plans. But I would introduce everyone from my different parts of life with a story. And I had a moment of inspiration! I love the color blue. I love teal and turquoise, royal blue, navy blue. Any shade of blue makes me happy. So why was I thinking that turning 60 was giving me the blues in a bad way? Turning 60 should give me the blues in a good way. Here I am! 60! So I bought blue napkins and ribbons and decorations: None of this stupid over the hill stuff or tombstone stuff. I am bright and cheerful and happy to be alive. I decided that I would also have a cake for my family. 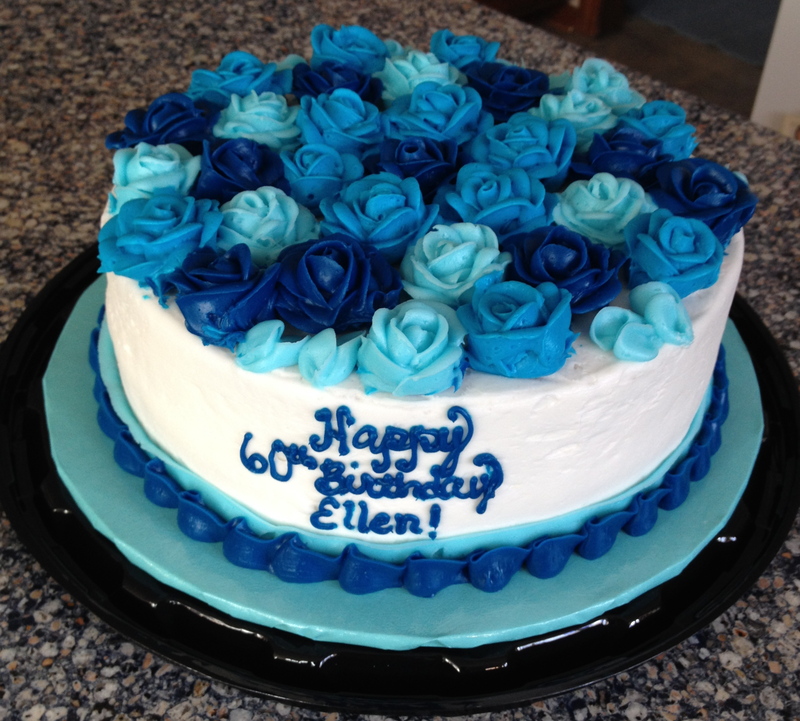 I asked the woman at the bakery to make me a cake to share with my family that would have enough blue flowers so that everyone could have one with each piece. She made me the most extraordinary birthday cake covered with flowers and she made it look like a lovely spring hat. I love it! I went back into celebration mode. I went out with my ‘mirthday’ (mirthday = middle of our birthdays) buddy. Her birthday is two days and one year before mine. We always celebrate with a lovely lunch and a shopping trip to Chico’s. The tradition continues. I met another best friend and went to a local favorite, Andre’s. It was delicious and fun. She surprised with a lovely sculpture of a writer. It sits happily on my entrance desk. And I went out with my husband and son for dinner and home for cake and gifts. As a family we accomplished a great success constructing the rebound trampoline I got for my birthday. I might be 60. But last week I walked almost 70,000 steps. I might be 60, but I still work part time. I might be 60, but I can still travel the world. I remember when I was in my early 20s. I was visiting my aunt and grandma. My aunt said, “I went to bed a young woman and I woke up an old lady.” She handed me the newspaper. And there was a little article circled. It said, “Elderly man, 59, falls to his death.” My aunt had said she was 39 for years. So my response, “No Aunt Leona, what are you talking about ! You are only 39!” We all laughed. But that article has been haunting me. Setting up for the tea party! 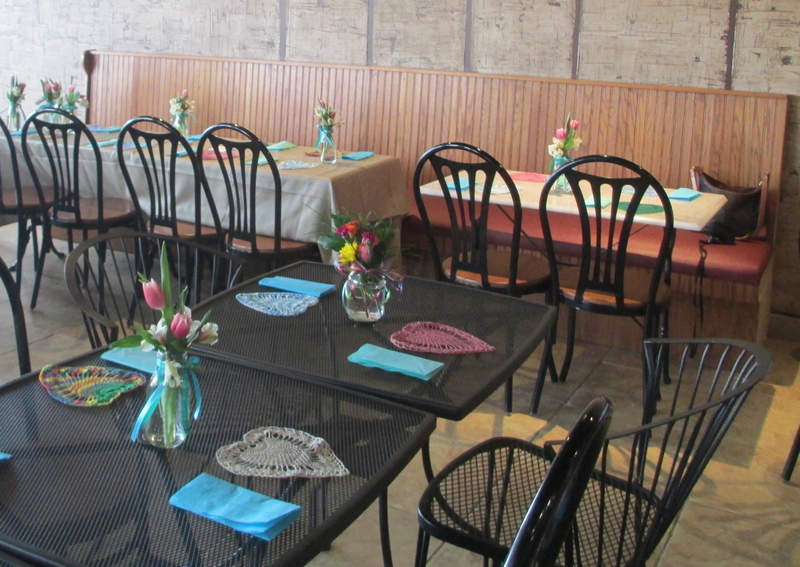 The room for my party looked wonderful with all the brightly colored napkins and flowers and hearts displayed on the tables. 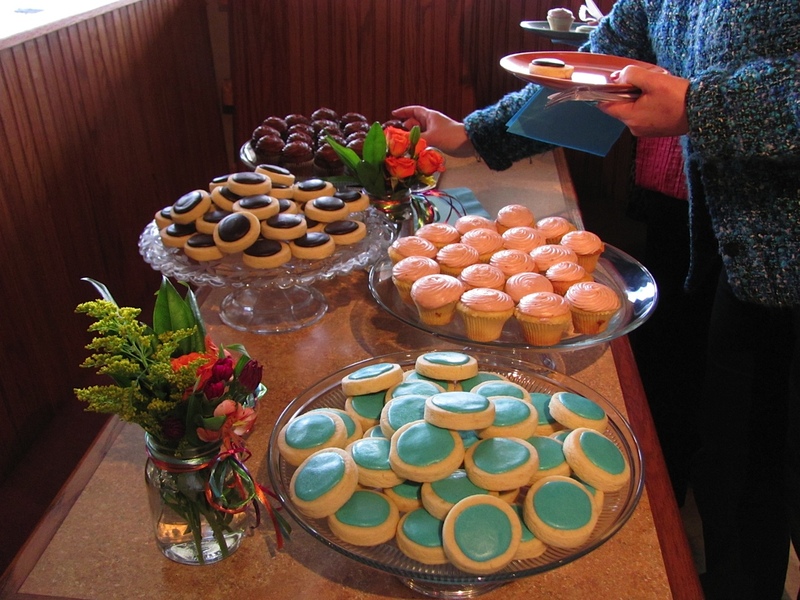 I even asked the bakery to make all the sugar cookies iced in teal! I had only my favorite flavors for the desserts: lemon, raspberry and chocolate. Everything looked and tasted wonderfully! Lovely turquoise cookies and other goodies. So today, to prove I am not elderly I have planned an exotic and eccentric tea party outfit to wear to my 60th birthday party. I am, of course, wearing blue: Blue dress, blue shoes, blue hat, and a lovely blue, turquoise and green sparkling and lightly beaded caftan-ish long jacket. I am ready to meet my sixties without feeling blue…but being the best and brightest blue ever!